Give Tom a call or send an email and he will contact you to arrange a convenient date and time to meet. At this meeting Tom will talk you through the Landscape Design Process and discuss your needs, thoughts, and intended uses for the garden and/or landscape. Since the new landscape is an investment it is worthwhile to establish a budget, if possible, for the project. There are landscaping budget options that can be discussed at this time. Tom will take a Landscaping Design Brief from you including likes and dislikes of plant material, colors, hardscape types, and other outdoor elements (patios, decks, outdoor kitchens, stone walls, etc.). After the first meeting Tom will send a written summary of your Design Project and the Landscaping Design fee. Upon your acceptance of the Design Project in writing we will proceed to the next stage. Tom will prepare a detailed site analysis of your property including location of boundaries, utilities, plant material, grade changes, and other existing elements. Site orientation and soil samples for testing, if needed, will be noted, along with reference photographs taken as part of your Landscape Design Process. 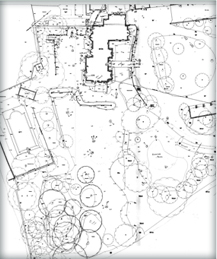 With the completed survey Tom will prepare a Concept Plan drawn to scale showing the garden or landscape layout, its features, and materials to be used. Also included are sketches and section drawings to help you visualize your Design Project. Tom will present the Concept Design at a time convenient to you, usually 2 to 3 weeks after the site analysis depending on the size and complexity of the project. Tom will discuss and address any concerns, modifications, preferences, and finalize the materials to be used. This meeting provides the basis for the Final Detailed Plan. From the approved Concept Design, with any changes or modifications, a detailed and accurately scaled Final Plan will be drawn. The Landscape Plan will show all softscape and hardscape materials plus any structural elements and/or water features when indicated in the Design Project. Tom will deliver the Final Plan to you for final approval 2 to 3 weeks after the Concept Design Presentation. Again, timing is dependent upon size and complexity of the project. The Planting Plan is an optional service that provides a layout of the planting areas and plant types consistent with the vision of the approved design. A detailed and accurate plan will be drawn indicating the exact locations, sizes, and quanities of all plant material. The Planting Plan is a separate quote considering style and impact as well as soil types, site aspect and orientation. 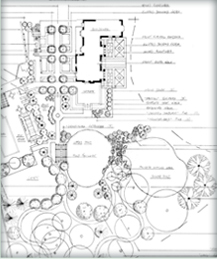 Detailed construction drawings are prepared for all hardscape elements (ie; steps, walls, paths, patios) as well as pergolas, ponds, or fountains. If necessary, dimension and secton elevation drawings are also prepared.